We just got back from celebrating Thanksgiving with Suna’s aunt and uncle in Indiana. We had a lovely time and of course ate lots of fabulous food. 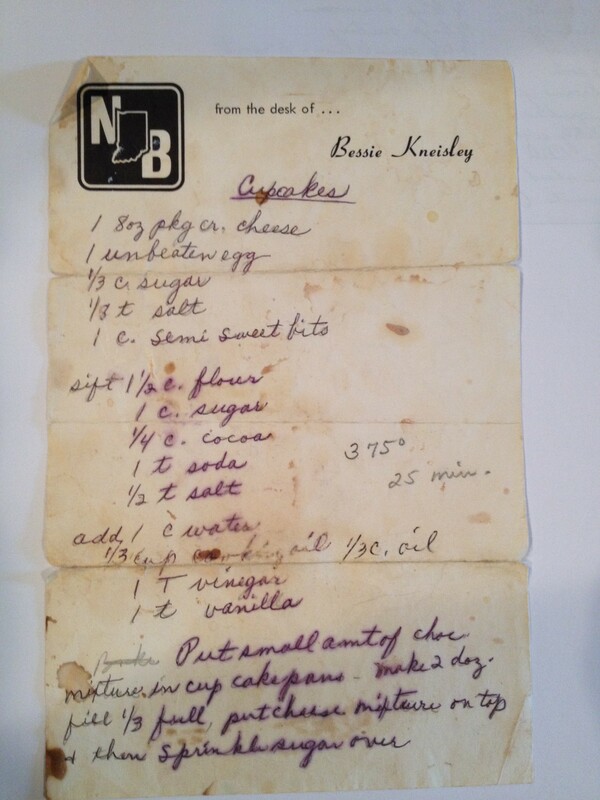 But one of the highlights was when aunt Rita pulled out some old family recipes, and presented Suna with the recipe for Black Bottom Cupcakes. 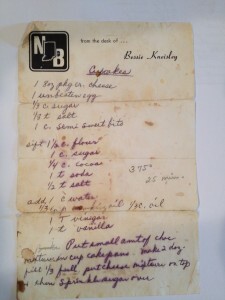 The recipe was handwritten by Suna’s grandmother Bessie, on stationery from the bank she worked at (and later became the first female executive). It was creased and torn, as well as stained, but it might have well have been a diamond ring (or in Suna’s case, a brand new laptop – she’s my Gadget Girl!). Suna was thrilled to have this link with her past, and her family. The most magical part of the recipe was that you could tell that it transported Suna to another time and place. She could see her grandmother standing in the kitchen, smell the cupcakes baking, taste them just as she did when she visited grandma Bessie when she was a child. Hopefully you were able to celebrate Thanksgiving with some or all of your family (chosen or blood). But perhaps some of your loved ones are no longer on this earth, like Suna’s grandmother. And yet they are still with us. I hope you can conjure up memories of someone you love, too. It’s amazing what even just a scrap of paper can do!